Found throughout the coastal plain. 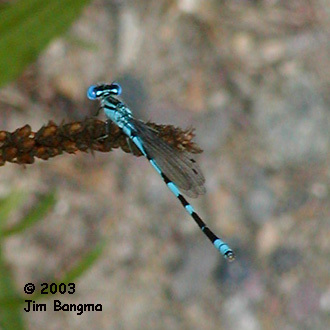 Very similar to Familiar Bluet and Big Bluet, there may be as-yet undiscovered differences in markings. It generally is slightly smaller, with tear-drop shaped postocular spots. At this stage of field ID, the shape of the terminal appendages must be critically examined to differentiate them.